The ARM7 is set to become the 8051 of the 21st century and already many projects and engineers are moving to it. Long-standing 8051 vendors Philips, are pioneering the use of the small but fast ARM7 core in general purpose devices. The ARM7 is a 32-bit core with some advanced features which 8051 users will not have encountered before. 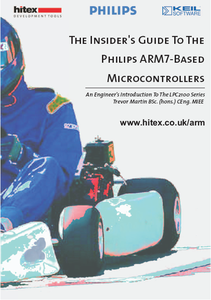 This can result in a steep learning curve when first getting to grips with ARM7-based devices. 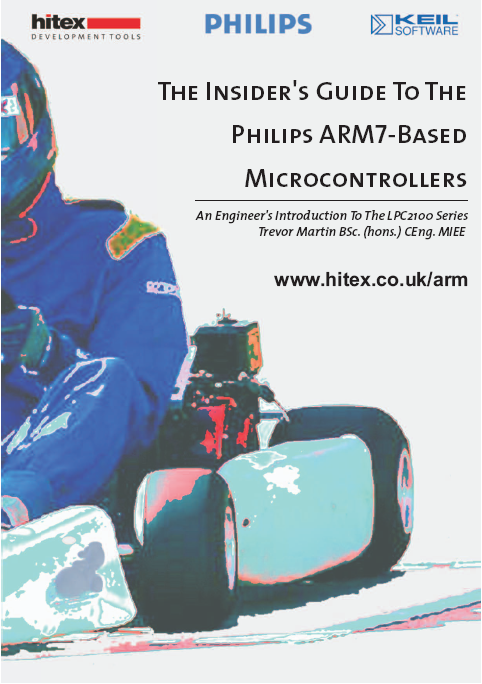 Our new 200-page Insider's Guide is a complete introduction to the ARM7-TDMI and the LPC21xx series. It covers all aspects of the family, including the CPU core, peripherals and programming techniques. Each major topic is illustrated with an example program which can be run using the Keil uVISION3 ARM development environment, that is included on the accompanying CD-ROM. Teach-Yourself ARM/LPC Programming: The Insider's Guide can be used as the basis of a self-teaching course when used with the Keil uVISION3 compiler IDE. This includes a powerful LPC21xx simulator debugger that allow real ARM/LPC programs to be executed without any hardware. All the examples included with the Guide can be built for either the simulator or the MCB2100 evaluation board. Andy Lindsay, What's a Microcontroller?